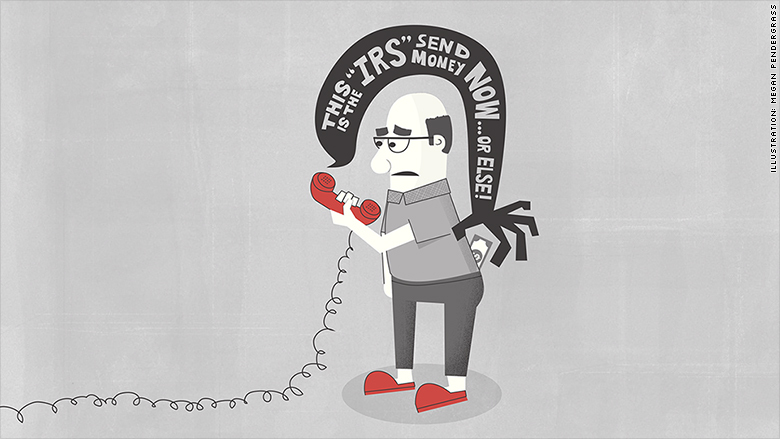 If someone calls claiming to be an IRS agent and tells you to send money, hang up. It's a scam that tops the IRS's 2015 "Dirty Dozen" list of tax scams. Here's how it works: Scammers change caller ID numbers to make it look like they're calling from the IRS. They often threaten vulnerable people, like the elderly and new immigrants, with arrest, deportation or the loss of a driver's license. The scammers use common names and may say they are from the IRS Criminal Division. They may claim to know the last four digits of your Social Security number. Or they may say you have a refund due and ask you for personal information to claim it. If they're demanding payments, however, they may send follow-up emails appearing to be from the IRS, saying payments be made on prepaid debit cards. The real IRS wouldn't call when first contacting you. And it never demands payment or asks for credit card or debit numbers over the phone. Nor does it ask for personal or financial information by email, text or social media.